I had the pleasure of spending a wonderful four day weekend at my parents’ house in North Carolina with two of my best girlfriends, Sarah and Haley. We had a really amazing weekend of hanging out with my parents / each other, getting some sun on the beach (or in Sarah’s case wrapping up like a burrito and avoiding all sun exposure… she’s the healthiest of us all! ), and we even squeezed in a half marathon (post on that to come later this week). 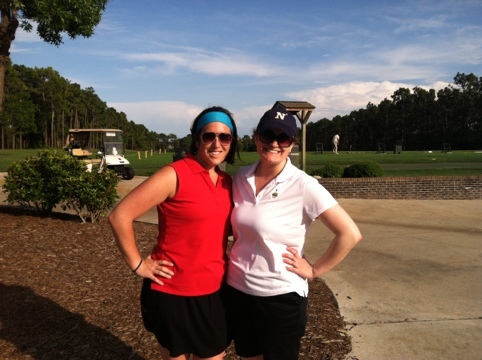 However, on Saturday afternoon, Sarah and I grabbed our clubs and joined my dad for nine holes of golf. 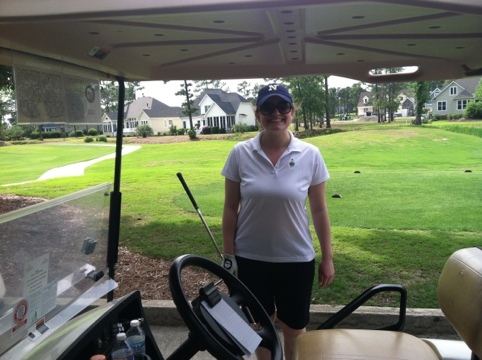 Sarah is a really impressive golfer… her swing is GORGEOUS. She played on her high school team, so she is, needless to say, much better than me. 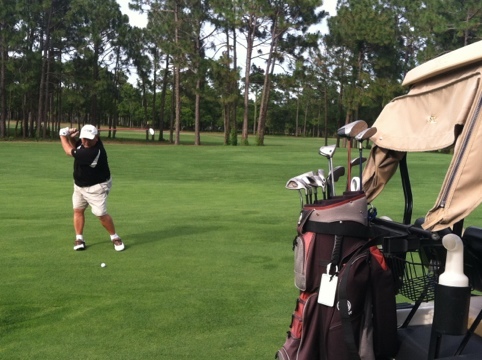 My dad has been golfing for many, many years, but much more frequently since moving to North Carolina full time two years ago. Patience is a virtue. People golf for YEARS and still struggle. Good golfers have terrible days. Some days I hit my 3 wood like a dream, other days I can’t get a decent shot all afternoon. The more frustrated I get, the worse I play. Sometimes you just have to take a deep breath and remember that you are in fact playing for fun. A short term memory serves you well. Whether it be your last shot, or your entire last hole, or your entire round up until this point, you cannot dwell in golf. This is true is basically every sport, including running. Shake it off and move on. There’s no where to go but forward. It’s all about feel. 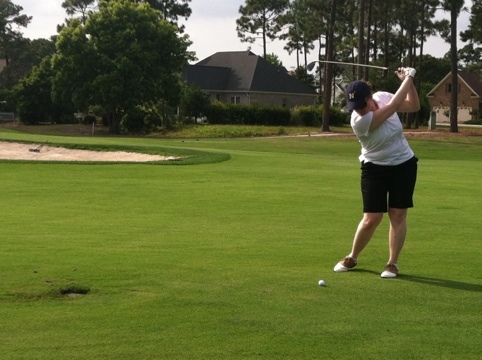 Differently than most other lady golfers (who traditionally struggle to hit the long shots, but have a good feel for the short game), my long game is awesome and I really struggle in the short game. I have such a hard time finding the right balance of force and aim. 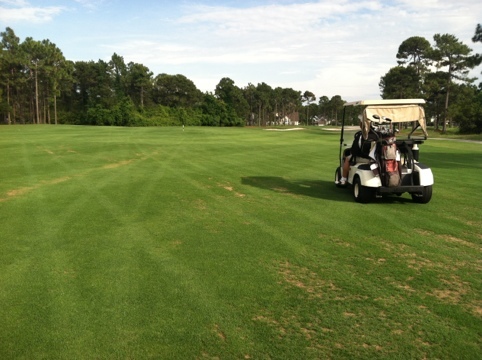 As in life, the short game is all about trial and error before you find the right touch. Pure force isn’t enough. 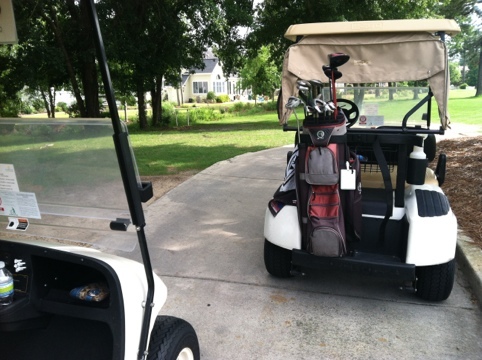 Golf isn’t a game that you can muscle into submission, unlike most of my other athletic pursuits. It requires that you understand how to approach it first. I once took an amazing yoga workshop on arm balancing and the instructor reminded us that without understanding the mechanics of a pose or how to approach it, it won’t matter how hard you try or how much strength you put behind it. This is true in life too. You have to understand a situation before you can change it. In addition to teaching me all of these life lessons… golf gave me a beautiful afternoon outside with one of my best friends and my dad. So for today, I am grateful.